T-Mobile will reportedly offer calls over Wi-Fi on upcoming Android (s goog) handsets according to leaked training and screen shots of a Wi-Fi Calling application. The images surfaced on TMoNews, and if accurate, indicate that unlike similar voice over Wi-Fi services that T-Mobile has offered in the past, the Wi-Fi Calling software will not seamlessly transfer calls from Wi-Fi to cellular networks like traditional UMA, Unlicensed Mobile Access, services. Instead, calls on Wi-Fi would be dropped once the handset moves beyond the range of a wireless network. The U.S. arm of the German phone giant is a big supporter of Google’s Android OS, and last week, when I asked a T-Mobile USA representative if there were plans to add UMA to Android phones, he said T-Mobile will continue to support UMA on the current and forthcoming BlackBerry devices and Nokia E73. That’s four models in total. In other words, T-Mobile has no plans on adding UMA to Android phones. I suspect that T-Mobile didn’t want to tip their UMA hand at that time as the company was prepping a big product launch with the G2: the successor to the original G1. Indeed, the Wi-Fi calling icon found in the leaked screen shots matches up with an icon that allegedly appears on upcoming Android phones for T-Mobile, lending a little more credence to the Wi-Fi calling support. But why would a voice over Wi-Fi app not hand off calls to cellular networks? One of my industry sources shed light on that topic. [inline-pro-content align=”left”]Here in the U.S., T-Mobile was the first to offer UMA calling on handsets, giving the fourth largest carrier a way to differentiate against its three bigger competitors. This original UMA solution required specific baseband, or radio chips, indicating a hardware solution limited to the few phones that offered Wi-Fi support. But now that Wi-Fi has proliferated through the smartphone market and operating systems have quickly matured, UMA-like service can be handled through software. Not only is this a cheaper solution for carriers and handset makers, it can be implemented faster as well. Instead of months of hardware design and testing, a software approach can be created, integrated and tested within weeks. 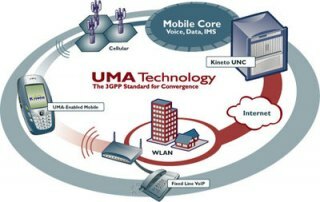 But a software UMA solution is hampered by the lack of service hand-offs to the cellular network. While that sounds like an glaring issue, it may be an overrated one. Industry research on the user behavior of UMA customers indicates that only one percent of UMA calls actually required this handover. Even better: without any chance of such a handoff between Wi-Fi and cellular networks, the UMA service doesn’t have to decide which signal is stronger, and that results in better battery life. As more consumers cut the landline cord, cellular calls in the home become important, a trend sure to be a hot topic at our Mobilize event later this week. For a carrier like T-Mobile that doesn’t have the largest coverage footprint, this trend towards a cell-phone-only society can put the company at a disadvantage: if customers don’t have good T-Mobile coverage at home, they won’t be apt to pick T-Mobile for service on that single handset. Skype calls over Wi-Fi aren’t even an option for T-Mobile since Skype for Android is limited in the U.S. to handsets on the Verizon Wireless network exclusively. Verizon (s vz), Sprint (s s) and AT&T (s t) have attempted to boost in-home signals with femtocells, or miniature cellular base stations that use Wi-Fi and a customer’s home broadband connection to provide better coverage at home. But T-Mobile hasn’t offered a femtocell. Instead of creating and selling such a device, its more likely that the carrier is building voice over Wi-Fi capability right into the handset through software. Even if these calls are limited to the local home network, Wi-Fi Calling gives T-Mobile a chance to fight for customers who want one phone for both in and out of the home. UMA keeps me a happy T-Mobile customer. Without it I have to stand in the middle of the street to make calls. The hand-off feature seldom works for me so no loss there. I’ve been using a Nokia 6301 from T-Mobile for years that has UMA capability, which I use a lot when traveling. When that phone broke and I replaced it with an Android phone (myTouch 3G Slide), it never dawned on me that the WiFi of the Android phone would NOT have UMA capability. I happened to go for a couple of months after acquiring the Android phone of not traveling, so then when I resumed my schedule and needed a phone that did UMA, I had a very rude awakening to find the Slide could not do UMA. The net result is that T-Mobile took a long term happy customer (me) and turned them into a very unhappy customer. Net result – at my company alone, T-Mobile lost about 10 customers. As the article mentioned, UMA under Android is software – which means there’s no excuse for any Android phone to not do UMA. I have used UMA via T-Mobile in various countries around the world and honestly could not live without it. I don’t see hand-offs as an issue at all as I’ve never needed one. A mix of UMA & Android is a dream come true for me (since the BB is a bit boring these days). There is no mention in the training slides that it this application is UMA. All we know is that it is WiFi calling. There are different ways to enable make fixed mobile convergence work. UMA and SIP/IMS being the primary ways. I completely agree that hand-offs are an overrated issue. What’s not clear about this rumored implementation of UMA is if users will be able to receive incoming calls and send/receive text messages via WiFi. I love UMA for international use and I’d love for it to hit upcoming T-Mobile Android phones.